Organizers also will collect the following items for community shelters. If you bring one of the following items you will be entered in a raffle to win a Gore running jacket! It’s the time of year again to pay dues for 2019. Please go to hobokenelysianettes.com and click on “Join” and follow the payment instructions. It’s only $25 and goes to the club’s insurance (boring but important) and party stuff and general merriment (exciting and very important). Alternatively, you could bring $25 to a Saturday run and pay in cash! Also, your $25 membership fee allows you access to the annual holiday party, which is the best party ever!! Note: if you paid in October or November, you are good to go for 2019! Congratulations to all the Elysianettes who completed various races this month, icluding the NYC Marathon and Philadelphia Half Marathon. A huge congratulations to all. Our morning event at Athleta was a huge success. Thank you to everyone who ran with us, and joined afterwards at Athleta. September was a busy month for the Elysianettes. We had a booth at Hobokens Art and Music Festival, where we attracted some new members. Marathon Training was well underway for the ladies running the NYC Marathon in November. However the heat and humidity was still lingering. What an unpredictable summer it has been. Lots of humidity for us runners! Please remember to stay hydrate before, during & after your run. Announcing Fleet Feets 5k Training Program. If you want to complete your first 5K, or are looking to just get in shape, here’s your chance! Their 8 week program begins with our kick off/information session on Wednesday, August 29 at 8pm, and first group training run is on Tuesday, September 4th. Workouts will begin and end at Fleet Feet Hoboken every Tuesday at 7PM for the duration of the program. Participants will train to complete the HoBOOken 5k on Saturday, October 27. There’s no time like the present to get up on your feet and start moving! This 8 week safe, fun, and non-intimidating program is designed for beginners who would like to run, run/walk or walk in a 5K race. Stay accountable to your goals, train with a group, receive personalized coaching, enjoy outdoor exercise. Join us for a fun run and event hosted by Athleta on Tuesday 28th August at 6.30-8pm. The 3-4 mile run begins at 6.45pm. Please RSVP either to the link above OR email elysianettes@gmail.com and tell us you are coming, so we can give Athleta an idea on how many will attend. Happy 4th July. Hope you all had a safe and sunny one whatever you were doing. Party with Purpose 5k race is on Tuesday 17th July starting at 7pm on Pier A in Hoboken. We always have great representation at this event. On-line registration closes on 13th July. Fleet Feet’s Summer Soldiers running program is back for 2018. Its free and open to all paces! Coming from work? They have a changing room available and watch your bag while you run! They meet every Wed night for 8 weeks. 3.3 or 6.6 Mile run options. Attend 4 Runs and receive a prize! Make it out to 7 runs and get some more gear! Attend all 8 and you’ll entered into a Grand Prize Drawing! Wow, the summer is well and truly under way, with high temperatures and humidity, make sure you stay hydrated before, during and after your runs. Plan your runs either early or later in the day when the heat is not so fierce. A great Elysianette turn out at the Spring Lake 5 mile over Memorial weekend, followed by the traditional after race drink at the Parker House. 🙂 This race is a very busy, but fun start to the summer. Congratulations all that completed it. A busy month is coming up in April. April 21st is the Hoboken Spring Fling Cleanup. Join us, as a team, to participate in the clean up after the regular Saturday run. More info to follow, but if you are free after the run at 10am, please join us in showing our little town some love. Wednesday 25th April Fleet Feet is throwing us a Sale/Party after the 7pm run. More info to follow but a great chance to get great buys on running gear, drink some wine, eat some pizza and win some prizes!! 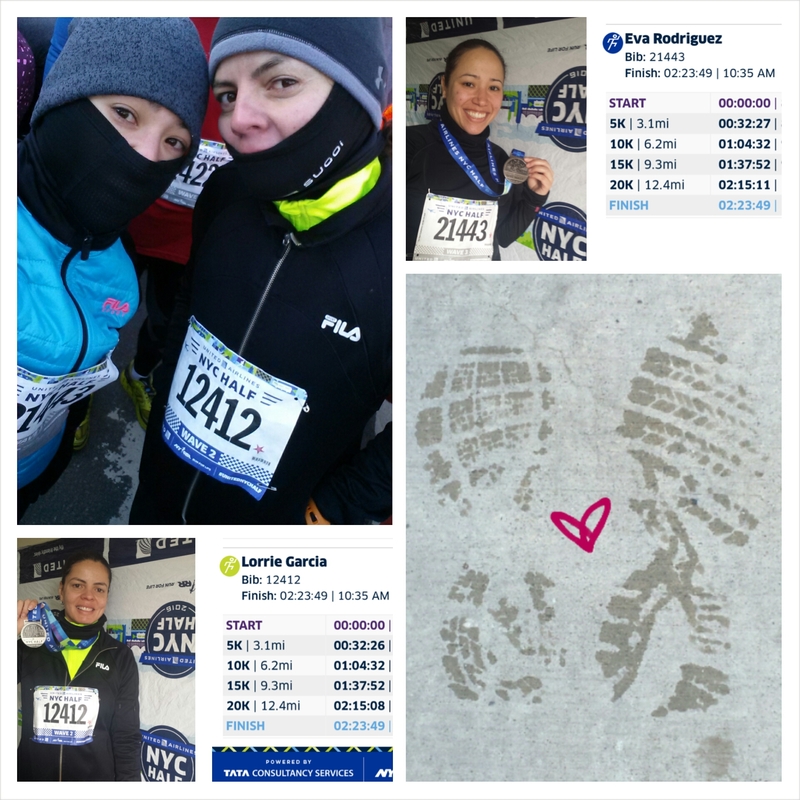 A cold and snowy March didn’t stop us from running in the NYC Half this month. The new route was particularly hilly and challenging, but fun all the same. Well done ladies! A great start to the New Year with 4 Elysianettes placing in their age groups at the Cupids Chase 5k in February. The race, wasn’t as cold as previous years, was a huge success, and we followed it up with a celebratory brunch at Raymonds in Ridgewood. Good luck to all of the ladies who are training for the NYC Half in March. It has been super warm this week. Remember to stay hydrated before, during and after your runs. Our friends at Fleet Feet Sports in Hoboken are offering a 10-12 week half marathon training course, starting 6th January. Whether it’s your first half marathon, or if you want to improve your time, gain fitness or lose weight…..this is for everyone! There will be an information session held at Fleet Feet on Wednesday 3rd January at 8pm. Ladies-the Central Park Holiday Classic Race is super fun. Choose from either 4 miles or 10k. See details below, or click here to sign up. Hope to see some of you there! Also coming up in February is the Cupids Chase 5k in Glen Rock. Again its a super fun race, followed by brunch. We usually have a great turn out of Elysianettes there. Click on the link in the events page to sign up today. A huge congratulations to all of the Elysianettes who completed the NYC Marathon on 5th November. We had a great cheer squad at mile 14 in Queens to cheer the front runners and the ladies. Thank you to everybody who came out to support, especially in the wet weather. The Hobooken 5k was a huge success. Thank you to all of our volunteers, who supported, cheered and helped with this event. We couldn’t do it without you. On Thanksgiving morning, Renee Gilbert will host the 4-Mile Silly Hats Turkey Trot fun run for the 7th year in a row, and you are all cordially invited. People gather in front of her place, at 704 Bloomfield, and start the run at 10 am. People can run or walk the course, which is around the waterfront in Hoboken. After the run, foil wrapped turkeys will be distributed to everyone on a first come, first served basis. Any further questions please email her at hardenergypt@gmail.com. Please note: this is not a competitive or timed run; it’s just to move around a little before you overstuff yourself at the Thanksgiving table. Silly Thanksgiving themed hats are encouraged but not required. Hope to see some of you there! As many of you know, the Hobooken 5k is a fantastic local run, which raises a lot of awareness and money for the Hoboken Shelter. All sorts of goblins, ghouls, pokemon and cute dinosaurs make their way through the streets of Hoboken in search of glory and the finish line. The responsibilities of the marshals include; pointing the runners in the right direction, cheering, alerting runners of any hazards or upcoming turns. As from immediate effect, our Thursday morning hill session has changed. We will continue to run at Stevens every 2nd & 4th Thursday of each month, however due to construction work, we now meet inside the gates on campus. Every 1st & 3rd Thursday we will meet at the bottom of the viaduct near Trader Joes for our hill workout. **SALE EVENT** Fleet Feet will be hosting a sale event exclusively for the Elysianettes on Wednesday 11th October at 7pm. Including pizza and wine, plus massive discounts off most items in store. (Please note that if you have a$25 voucher, this can NOT be redeemed on this evening). Please come along to shop, buy and meet fellow Elysianettes. A huge congratulations to all the ladies who completed the Bird-in Hand half marathon at the weekend. It looked like you all had a fun time, and that the weather was kind to you all. This Wednesday 13th September, we will be doing our usual run from Fleet Feet at 7pm. However rather than finishing at Fleet Feet, we will finish the run at Devotion Yoga, where we will take a runners yoga class. This will end at approx 8.45pm. Congratulations to all the ladies who raced, ran and trained this month. We had some brutally hot days. Keep up the good work! Wow! Another July has flown by, and August is upon us. Half marathon training is well and truly underway for those ladies doing The Bird in Hand Half Marathon in September, and full marathon training for those doing the TCS New York City Marathon in November. Good luck with the training everyone, and remember to stretch, foam roll and stay well hydrated. Yoga is a great way to compliment those long runs, and we are very lucky in Hoboken to have various yoga studios throughout our city, offering a wide choice of classes, times and levels. 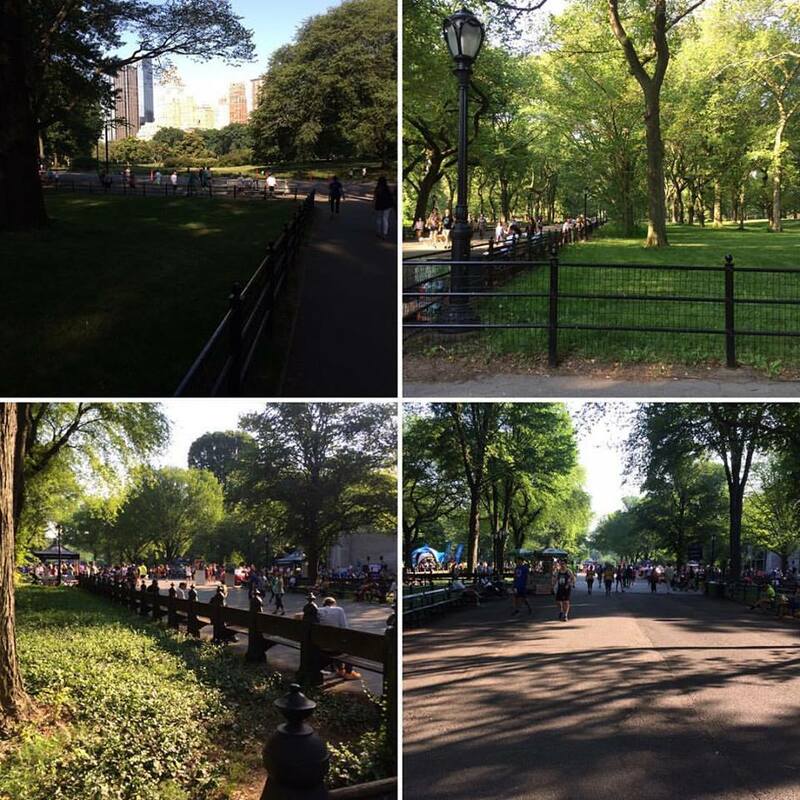 A lot of us had a great day yesterday at the NYRR Mini 10K in Central Park. Yet again it was a gloriously hot day. Well done! Please remember now that the hot weather is with us to stay hydrated before, during and after running. Also remember your sun block! Registration is now open for the Party with a Purpose 5k in Hoboken on 11th July. Also the Ar BNB Brookyn half took place. A great race which starts in Brooklyn and ends in Coney Island. Well done to everyone to completed it. This coming Tuesday, 7th March, join us at Fleet Feet at 7pm to celebrate National Cereal Day with a fun run, demo the new Saucony Kinvara 8 running shoe, and eat cereal. The fun run will be a 3 or 6 mile loop. Hope to see some of you there. SAVE THE DATE.…..Sunday 9th April-Lincoln Tunnel Challenge. Stay tuned for information how to register as a team. Congratulations to all the Elysianettes who ran the NYRR Washington Heights 5k on Sunday morning in very cold conditions. You girls rocked! Spring is in the air! Enjoy the warm weather ladies. Remember to keep hydrated. Happy Running! RUNNING SCHEDULE CHANGE: THE TUESDAY NIGHT RUN WILL NOW BE HELD ON A WEDNESDAY NIGHT. 7PM FLEET FEET. WE LOOK FORWARD TO SEEING YOU THERE. This Saturday 28th January, we will be holding a special Fleet Feet Brunch & Sale. Meet at Church Square at 8.30, run, and then shop. Selected items will be on sale. Please drop us an email to let us know that you will be attending, so we can give the guys at Fleet Feet an idea of numbers. RUNNING SCHEDULE CHANGE FOR JANUARY & FEBRUARY. For the months of January & February, our Tuesday night run will be on a Wednesday. Same time & place. Look forward to seeing some of you there. Hope you all had a safe & fun Thanksgiving. We were joined on our regular Saturday morning run by two of our youngest members. Enzo just 2 weeks old, and Jasmine, 7 months, were both wrapped up warm, and more than happy to let their moms chat and catch up with the group over a post-run coffee. A huge well done to all the Elysianettes who ran the NYC Marathon on Sunday 6th November. You are all amazing-Patrice, Heidi, Donna, Emma & Chrissy. Great job! Enjoy your recovery after all the hard work you put in. Also thank you to everyone who came out to support them too. Our amazing Emma is running the New York City Marathon on 6th November in aid of Autism Research. This a great cause, as 1 in 68 children are diagnosed with Autism in the US. Please if any of you can spare a couple of dollars to help Emma achieve her target of $3000, click here to donate. Every penny helps! Well done to the Elysianettes who ran the HoBooken 5k today. It was a great turnout. Thank you to all the ladies, and partners/friends, who volunteered too. 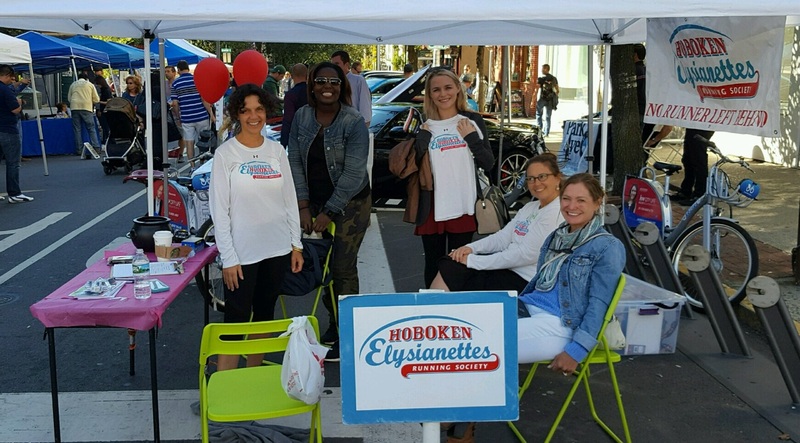 A huge thank you to the ladies who helped “wo-man” our booth at the Hoboken Music & Arts Festival this weekend. We are now looking for volunteers to help with the Hobooken 5k event on 29th October. Please let us know if you are available to help. A very busy day for the Elysianettes yesterday on 24th September, at the O’Connells 5k in Union City. 4 medals were awarded to the Elysianette Runners. Great running Judy, Kari, Lorrie & Nancy! Last weekend, a group of Elysiannettes ran the Philadelphia Half Marathon on a very humid, but overcast day. A special mention and big shout out to Mary, who completed her first half marathon. Hope you ladies all had a great summer, with lots of running, relaxing and fun! As from next Saturday, 17th September, we will resume our normal running schedule of 8.30am. 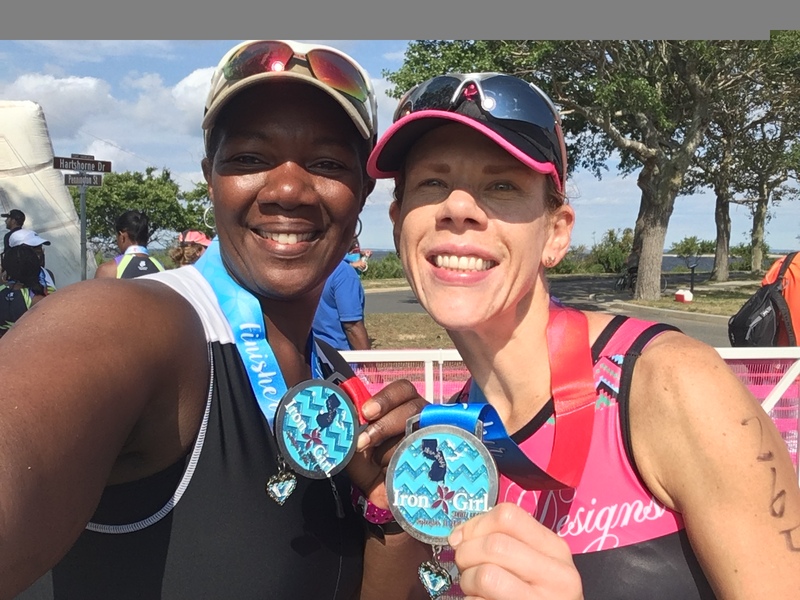 A massive well done Elysianette members Kristen & Juilet, who completed the Sprint Tri in Sandyhook on Sunday. In a effort to beat the heat, our Saturday runs will start at 07.30am as from 23rd July 2016. This will be a temporary change for the month of August, and upto and including 10th September. Please remember to hydrate well before, during and after running. A massive congratulations to Elysianette, Lorrie, who came 3rd in the Teterboro Airport 5k last weekend. Well done Lorrie! A huge congratulations to all ladies who ran NYRR races this weekend. 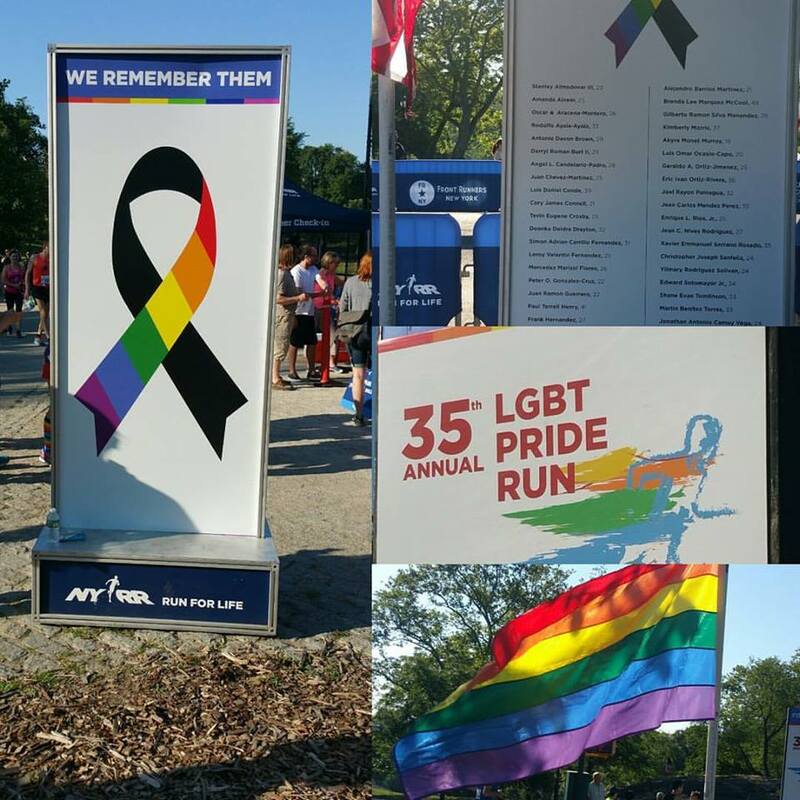 We had runners at both the Pride 5 mile run on Saturday, and the Achilles 4 mile run on Sunday. Great job ladies. As from immediate effect, we are excitied to annouce that our Tuesday night run will now start at 7pm, rather than 8pm. We will still meet at Fleet Feet, and will leave at 7.03 sharp, for a 4 mile run. The good news is that you can head straight to Fleet Feet after work, and change into your running gear there, and leave you bags there while we run (All belongings are left at owners own risk). See you all there! Congratulations to all of the ladies who ran races in May, in particular the Spring Lake 5. We have experienced some extremely hot weather conditions already, so please make sure you hydrate properly before, during & after running. 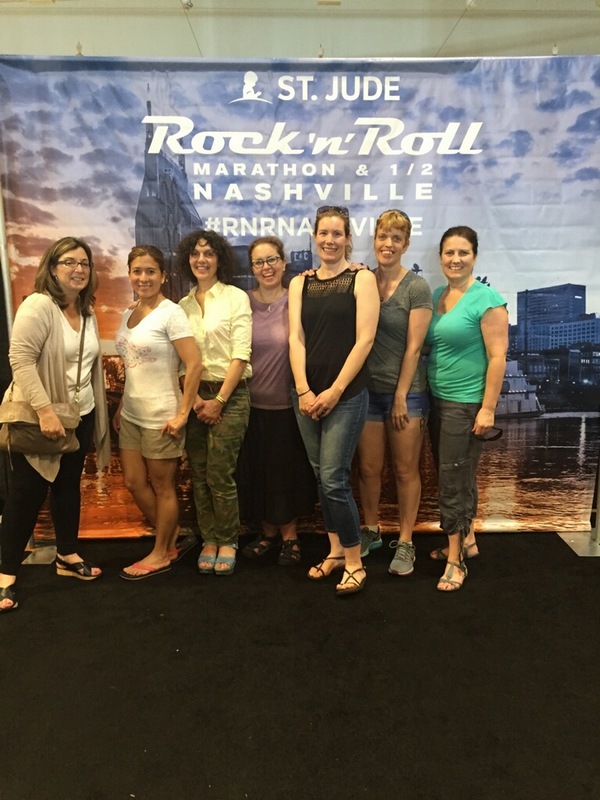 On 28th April, a group of Elysianettes travelled to Nashville, TN, to complete the very hilly and humid Rock N’ Roll Series.Well done to everyone who ran on the day. Check out our pictures in the gallery. Watch this space for the next Elysianette trip! A huge congratulations to Elysianettes Eva & Lorrie, who completed the NYC Half marathon in the cold. Join the Elysianettes for a social night at Maxwells to watch the amazing RAEL-Genesis Tribute Band perform. Saturday 2nd April. Tickets cost $14.99-$19.99. Please let us know if you are coming by emailing us. A huge congratulations to the ladies who completed the Cupids Run on Saturday 13th February on a cold but sunny morning. Great job ladies! So as SuperStorm Jonas made many of us miss the Saturday morning run, our fabulous leader Nancy was still out there, doing her thing! We love you Nancy!